As we all know, Nutrition Month is always held every month of July. This is to create awareness among us on the importance of our nutrition. Presidential Decree 491 (1974) or the Nutrition Act of the Philippines mandates the National Nutrition Council (NNC) to lead and coordinate the nationwide campaign. The Nutrition Month celebration is now on its 42nd year and has been committed to involve the stakeholders which includes schools and local government units. 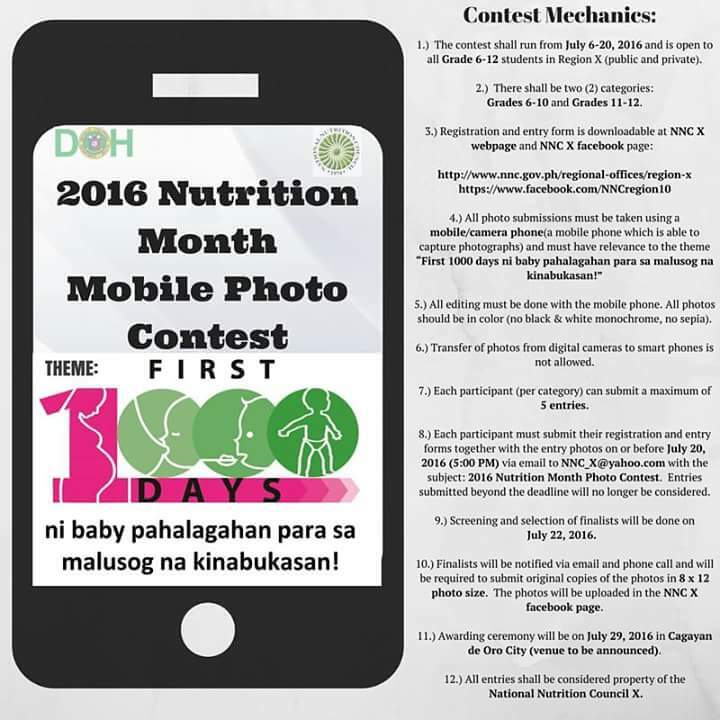 As part of this celebration, National Nutrition Council Region X (NNC X) is conducting a Mobile Photo Contest open to all Grades 6-12 public and private school students in Region 10. The main objective of this contest is to increase awareness on the importance of proper nutrition and early childhood care and development by focusing on the theme. The deadline for submission of entries is on July 20, 2016. Let us support in dealing with hunger and malnutrition. One Region in Nutrition!